In last week’s article, I eluded to the reality that multiple offers are back in the resale market and I’ve been asked a few times by clients to elaborate on where and what these properties are. So in this week’s newsletter, we’ll go over the lay of the land (i.e., the current situation). Direct from the Streets of TO – Before you read on, let me preface you with this. Everything I’m about to tell you is from first-hand experience from the last month of transacting straight from the field. It’s not speculation nor theory. 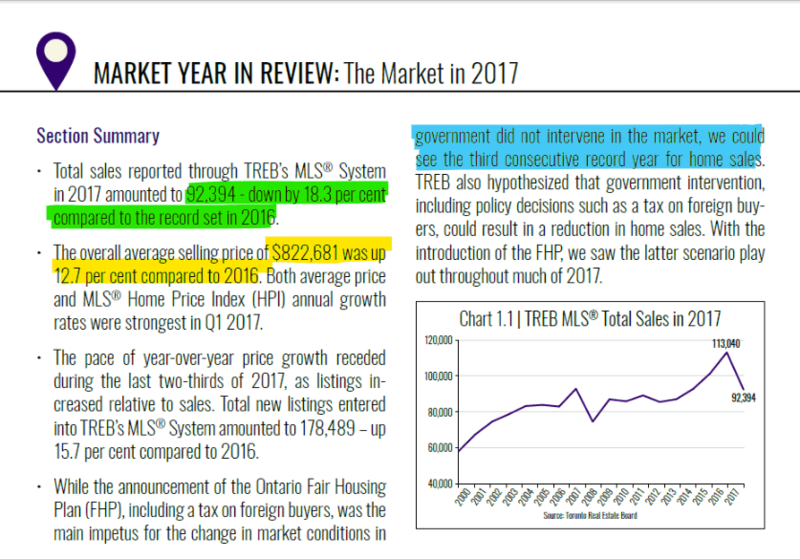 The Numbers – First off, TREB released it’s annual 2017 market review and as expected (and as I’ve been preaching), the sales activity in 2017 was down 18% compared to 2016. HOWEVER, the average price was $822,681 in 2017; this is actually UP 12.7% from 2016. Sticker Shock?? If you are shocked by that statistic, then you’ve been bamboozled by the media! The only area in the GTA where the average prices are dropping is the $1.5 million+ 905 detached houses. Anything less than $1 million in the GTA, specifically in the 416, has been moving incredibly fast – I repeat, INCREDIBLY fast. I always speak about the shift to affordability, which means that people still want to be in the market but they can only afford to buy the entry-level properties. These are your properties sub-$700K for an average family. The major consumers looking in the sub-$700K range are first time home buyers, investors and downsizers. This category of buyers accounts for over 60% of the market, if not more. So with that many people after the same asset category, combined with the huge lack of supply that we’re facing, this is the exact reason as to why we are seeing multiple offers again. Some more mind-blowing statistics and numbers will appear in next week’s featured insight article where we will talk about the huge backlog caused by a lack of supply at the entry-level market. It’s real and it’s here to stay. So be sure to keep your eyes peeled for this insight next week! It’s not as crazy as early 2017 where there were 10+ unconditional offers; it’s more like 2-5 multiple offers now. These offers are sometimes conditional and sometimes unconditional – it really depends on the property. I’ve frequently experienced this in the downtown condo market between the $500K – $800K range. 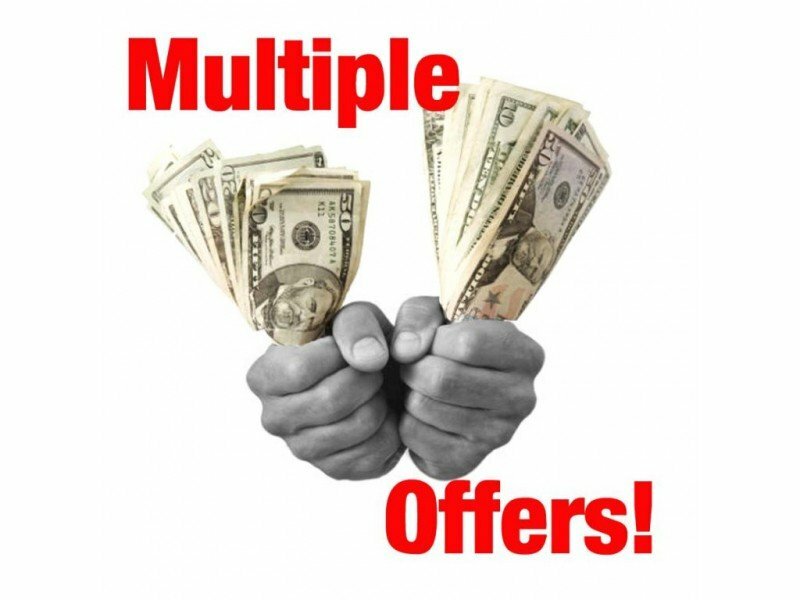 Anything that shows nice tends to lead to multiple offers. This has also been seen in the 416 townhouses less than $900K. So Where Are The Headlines About This? Well, what I’m about to tell you next are the secrets that realtors are using to create multiple offers. Mostly gone are the days where a property was listed at a low price of $100,000, waiting for 10+ offers and a huge bidding war. These days, there are two new favourite strategies that seem to be popular with the listing agents. Strategy #1 – Under-list the property by 2-5% of market value and hold offers for 1 week with the popular line: “Will graciously review offers on X date, if any. Seller reserves the right to review pre-emptive offers”. This basically means that they’ll hold offers and review later, if any (keywords: if any); in other words, they aren’t expecting a ton. Combined with the fact that they are reviewing pre-emptive offers, you might as well just say “offers anytime”. However, this seems to be working as I’m seeing multiple offers on offer dates or even beforehand. All it takes are two motivated buyers with good decent offers to get the deal done. Strategy #2 – Listed slightly below market value and ask for 48 hours irrevocable. Irrevocable, for those who do not know, is the amount of time the offer is valid for. If the sellers are asking for 48 hours irrevocable, it means they want the offer to be valid for 2 days. To the untrained eye, this looks like a standard listing protocol. However, it is not. The worst lie I’ve heard was “my sellers are out of town” when they were clearly living in the unit. The 48 hours irrevocable allows the sellers to show the units over the weekend and wait for an offer to come in. When an offer is received, all the other agents who have shown the property will be notified. In turn, this means that these other agents will have 48 hours to submit an offer and meanwhile the initial registered offer is still valid. Then, the selling agent will set a time to review all the offers with the seller. Sneaky sneaky, but clever nonetheless. As a realtor, I am not too proud of this strategy, but I must give the originator of this strategy a slow clap for his or her sneaky creativeness. The Wrap – So yes, multiple offers are back indeed, but disguised as something different. Will they become more prevalent as the market starts to pick up in March? I think so, but only time will tell. Just be prepared! Previous Previous post: How First Time Home Buyers are ACTUALLY Getting Destroyed by Stricter Lending Policies. Next Next post: 10 Shocking Condo Stats That Will Blow Your Mind!